Iffath is our administrative assistant and has been with Marmer Penner Inc. since 2008. Iffath applies her skills in client services, research, and writing for the firm, and has assisted with the compilation of income and valuation reports, and with analyzing financial statements and income taxes returns, with close attention to detail. She brings a broad background to the firm. She has expertise in statistical analysis, and administration having worked for the compliance department of a large Canadian bank. 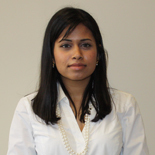 Iffath received both her Honors Bachelor of Science and Master of Public Health degrees from the University of Toronto, and is currently pursuing her Doctoral degree at York University.